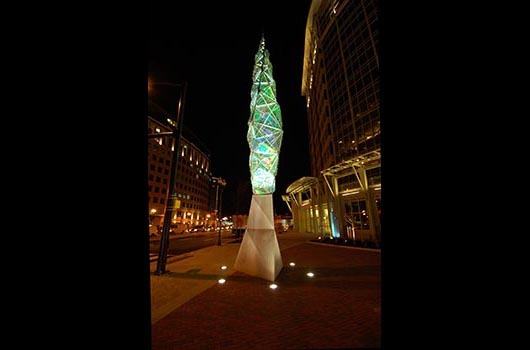 Flame‘s helical form is composed of dichroic glass joined with a steel framework. Dichroic glass exhibits different colors as it reflects or transmits light. 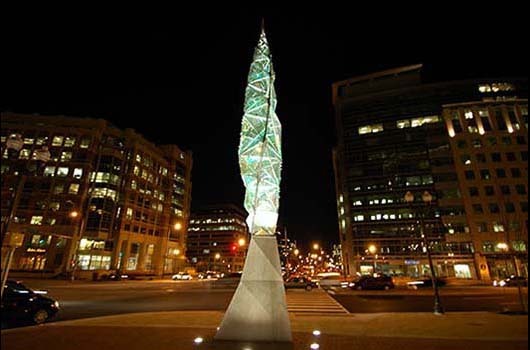 Acting as a beacon to those entering and leaving the Ballston neighborhood, Flame‘s appearance is in constant flux as lighting conditions shift. Sunlight strikes the glass to create a shimmering appearance, while internal lighting subtly illuminates the sculpture after dark. Artist Ray King began his career as a stained glass apprentice, receiving a Louis C. Tiffany Fellowship in 1975. Flame represents an outgrowth of King’s original training and his decades-long fascination with color and light. King eventually brought his glass work into three dimensions, thus expanding the effect light could have on his sculptures. 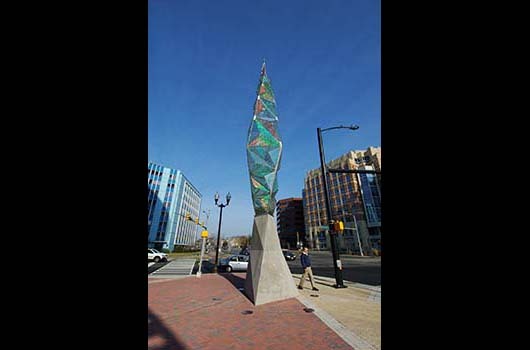 Flame won the Americans for the Arts Public Art Network Year in Review Award. Funded by the JBG Companies.